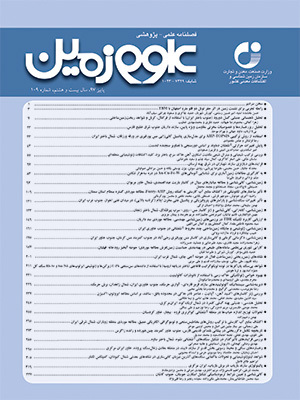 در این مطالعه به بررسی تأثیر افزودن نانوذرات کائولینیت بر ویژگی‌های ژئوتکنیکی خاک رسی پرداخته شده است. جهت تهیه نانوکائولینیت از روش مکانیکی آسیاب گلوله­ای استفاده شده است و پودر اولیه کائولینیت به مدت 10 ساعت در دستگاه Planetary Ball Mill خرد شده و به مقیاس نانومتر(کوچک‌تر از 100 نانومتر) در آمده است که تصاویر تهیه شده توسط FESEM از نانوذرات مؤید این مطلب است. سپس نانوذرات به دست آمده با نسبت‎های متفاوتی از وزن خاک با خاک رسی (CL) ترکیب شده و میزان تغییر پارامترهای ژئوتکنیکی خاک قبل و بعد از اضافه کردن نانوذرات توسط آزمایش­های تراکم، برش مستقیم و کاساگرانده مورد تحقیق قرار گرفت و میزان بهینه افزودن نانوذرات به دست آمد. نتایج نشان داد که حدود روانی و خمیری خاک رسی با افزایش میزان نانوذرات به ترکیب خاک افزایش می­یابد؛ ولی از آنجایی که آهنگ افزایش حد خمیری نسبت به حد روانی بیشتر است؛ شاخص خمیری کاهش می­یابد که نتیجه‎ای مطلوب در مهندسی ژئوتکنیک جهت اجرای پروژه­های عمرانی است. همچنین با توجه به نتایج آزمایش تراکم، وزن واحد حجم خاک رسی تا حد خاصی از افزودن نانوکائولینیت افزایش می­یابد و بعد از آن حد دچار کاهش می­شود. میزان چسبندگی خاک رسی نیز با توجه به نتایج به دست آمده از آزمایش برش مستقیم تا افزودن حد مشخصی از نانوذرات افزایش یافته و بعد از آن حد تغییر چندانی نمی­کند. نتایج آزمایش­های XRD و XRF نشان دادند که ترکیب شیمیایی نانوذرات حاصل از روش آسیاب گلوله­ای مشابه ترکیب شیمیایی پودر مادر است و تغییری نمی­یابد. In this study, the effect of nanokaolinite particles on geotechnical properties of clayey soils is investigated. The mechanical method of Planetary Ball Mill was used for production of nanoparticles. For this, initial kaolinite powders was milled in Planetary Ball Mill for 10 hours with speed of 500 Rpm of machine. Output powder was in nanometer scale that images produced from FESEM verified this. Then, nanoparticles were mixed with clayey soil (CL) in different weight ratio of dry soil and change percentage of geotechnical properties of treated soils was investigated by compaction, direct shear and cassagrande tests and optimum percentage of added nanokaolinite was determined. Results showed that LL and PL of soil increased while percentage of added nanoparticles increased but since increasing of PL is larger than LL, thus PI is decreased that it is favour for geotechnical engineering for construction. Also with attention to results of compaction tests, density of clayey soil was increased with adding of nanoparticles to an optimum quantity and after it decreased. It is determined from direct shear tests that cohesion of clayey soils increased with adding of nanoparticles to optimum quantity and after it is changeless approximately. Results of XRD and XRF tests showed that chemical integition of nanoparticles produced from planetary ball mill is similar to initial powder and not change. ASTM D 698-78- standard test method for compaction test in laboratory. ASTM D 3080-90- standard test method for direct shear test of soils. ASTM D 4318-87- standard test method for Liquid Limit, Plastic Limit and Plasticity Index of soils. Bahmani, S. H., Haut, B., Asadi, A. and Farzadnia, N., 2014- Stabilization of residual soil using SiO2 nanoparticles and cement, Construction and Building Materials Journal, Vol. 64, pp. 350-359. Burton, C., 2009- Silica sol for rock grouting, Laboratory testing of strength, fracture behaviour and hydraulic conductivity, Tunneling and Underground Space Technology, Pages 603- 607. Khalid, N., Arshad, M. M. Mukri, M., Mohamad, K. and Kamrudin, F., 2015- Influence of nano-soil particles in soft soil stabilization, International Journal of Geotechnical Engineering, Vol. 20, pp. 731-738. Lambe, T. W. and Whitman, R. V., 2007- Soil Mechanics. John Wiley & Sons. in measurement and modeling of soil behavior, ASCE. Majeed, Z. H. and Taha, M. R., 2011- Effect of nanomaterial treatment on geotechnical properties of a penang soil, Journal of Asian Scientific Research, pp 587-592. Patricia, M., Yuanzhi, L. and Gallagher, P., 2007- Meter Column Testing of Colloidal Silica Transport through Porous Medium, , Innovations in Grouting and Soil Improvement (GSP 136), Proceedings of the Sessions of the Geo-Frontiers, Austin, Texas, USA. Zhang, G., Germaine, J. T., Whittle, A. J. and Ladd, C., 2004- Index properties of a highly weathered old alluvium, Geotechnique 54, No. 7, 441-451.